Click here to see more trailer stills for Home World! Since I'm a benefits broker here in LaLa Land (aka Los Angeles) I do a lot of work with folks in what we Angelenos call The Industry - as in, the Entertainment Industry. Anybody working in or around Hollywood knows how horrendously difficult it is to break into the Industry, so I'm very, very respectful of my clients' privacy. 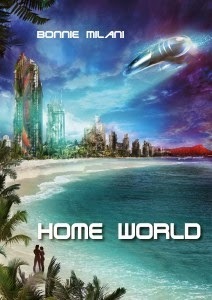 Still, like any other author I'm proud as a new mama of 'Home World'. So I sent ebook copies of the novel to folks I knew well and figured would actually enjoy the book. To my vast surprise, a director client of mine dropped me a note a couple of weeks later to say he didn't just love the story, he WANTED to do a movie style book trailer for me. Turns out he'd been looking for a short sci fi project, & Home World fit the bill. Good thing it was a note and not a phone call, because I really could not have managed a coherent sentence at that point. Now, I've been around the Industry for over 30 years, so I thought I had a fair-dinkum notion of just what it takes to put a shoot together. OY, was I wrong! My client - who was now my producer/director - was absolutely wonderful. We've worked together on his insurance so some years, and I've had the privilege of watching him work at work on set at Warner Brothers Studios, but this was my first chance to be a part of a project. But as the project developed over the next four months he walked me through the logistics of location scouting, developing a script (I got to co-write! ), assembling a crew, casting, wardrobe...and, nightmare of nightmares - production insurance! Ouch. But, finally, we had the locations worked out, the sets built, the cast selected. Thanks to my wonderful producer, the entire project was a labor of love for all concerned. He talked a cinematographer friend into being our Director of Photography (DP). This was HUGE, because our DP insisted that if he was going to shoot the trailer, he was going to do it RIGHT. So he brought his whole lighting and sound crews - AND used Arri Alexa cameras for the shoot. That didn't mean anything to me, either, until my producer mentioned I might have seen what those cameras can do in a little movie called 'Avatar'. 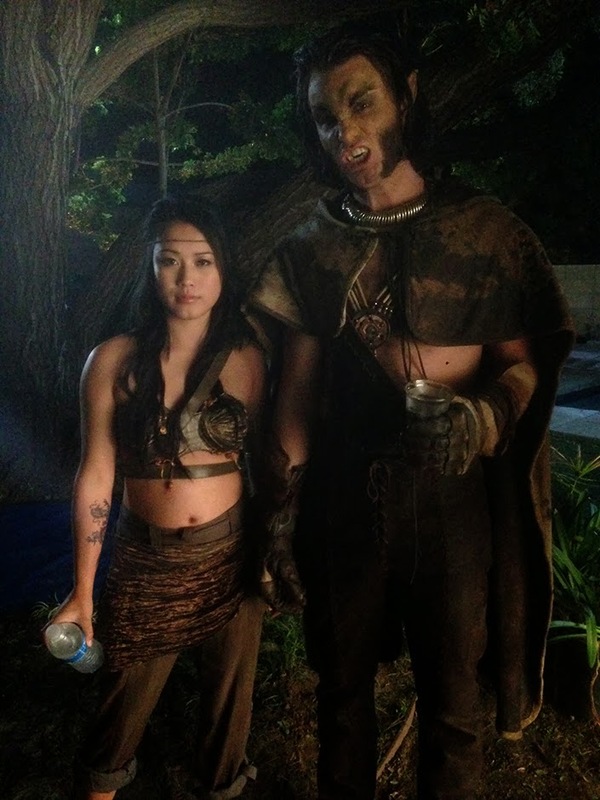 The REAL fun, though, was wardrobe and make-up. This being a labor of love, we had no budget to speak of. So we borrowed. You'll recognize some of the outfits from movies like 'Matrix' or 'Snow White & the Huntsman'. I was on set to help with some last minute script rewrites, and help our wardrobe mistress (who turned out to be another Home World fan!) make sure the costumes came as close to the characters in the novel as possible. The biggest challenge, of course, was Strongarm - turned out that getting a set of MOVABLE wolf's ears requires full-scale audioanimatronics plus two months' design & programming time. Oh, and quite a few thousands of dollars. Emphatically not in the budget. So we worked around it. How? 'm not giving that one away! The shoot itself took about 20 hours, non-stop. Anybody who's never been around a working set tends to think it's all glitz and glam. Let me tell you - the crew started set up around 4:30 in the morning. We wrapped the shoot at midnight. TWO breaks - 15 minutes for lunch while crew loaded sets for the next location and 15 minutes for dinner. Kim Huynh, the girl playing Keiko, didn't even dare eat, because she couldn't afford a belly bulge in the next scene. 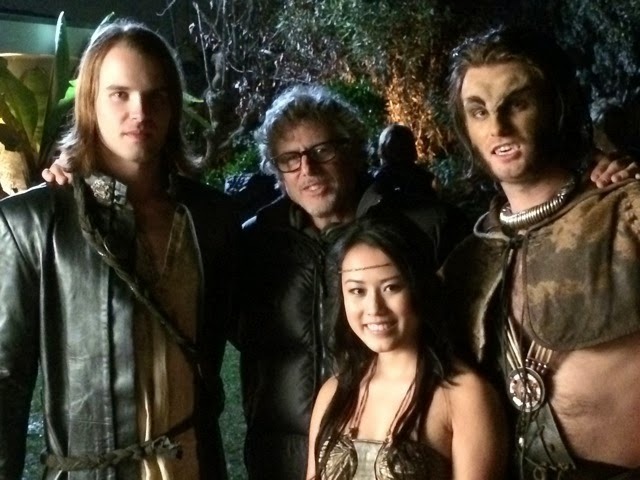 During a day shot, Carson Aune (whom we 'borrowed' from True Blood) had to sit through light set up (think 'boiling air') in full leather regalia with the instructions NOT to sweat. Let's hear it for actors - he didn't. The still shots give you a hint of what goes into making Hollywood magic. Come back in March - and we'll welcome you to Home World. Learn more about Bonnie Milani and Home World via her Blog Ring of Power interviews. WOW, Teresa, you are just absolutely the BEST! THANK YOU SO MUCH for your support and wonderful enthusiasm! This looks AMAZING! Can't wait to see the trailer. :) Thanks for sharing your story.